Need to catch up? Read Part 1 and Part 2 first! After my second leg, we booked it to the van because Mike's leg was only 2 miles. 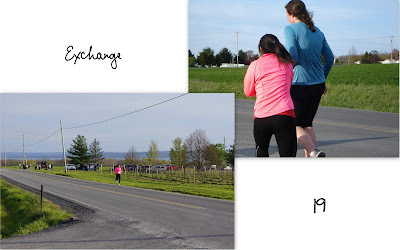 We knew we only had about 16 to 17 minutes to get to the next exchange point so I had no time to stretch after my leg. I did bring "the stick" with me, so I used that on the way to the exchange point and refueled with my mom's amazing homemade gluten-free granola bars. Delicious! 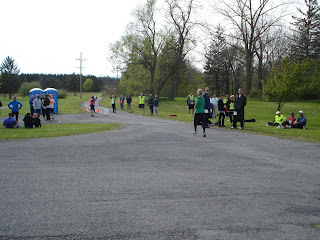 Mike was so tired by his last leg but he gave it his all since it was such a short distance. I would say he likes running relays! We had plenty of time to get to the exchange point, but we dropped my mom off before parking the van just in case. About 5 or 6 minutes after arriving I could see Mike running up the hill! He had changed his t-shirt in between his 2nd and 3rd legs because he had sweat so much on the evil hill. 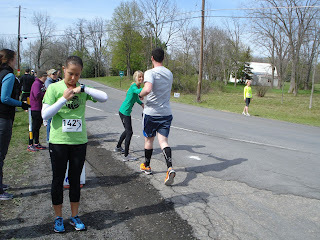 My mom grabbed the slap bracelet from him and our first runner of the day had completed all three of his legs! Mike hit 7:52 and 8:25 pace for the 2 miles. At this point we were still well below the estimated arrival time for the 9:00 minute pace group, as we had been all day. When we got to the next exchange point we had some time to sit down on the grass and relax. 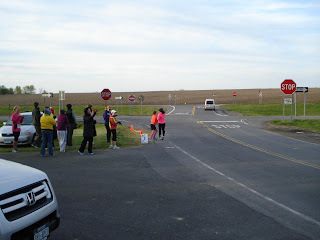 My mom's final leg was 4.8 miles so it took some time for her to get to the exchange point. Cat had her longest leg coming up too, 5.4 miles, and part of the leg was on a trail. She was a little worried about this part but her mom, our lovely driver, kept reassuring her and all of us that we could accomplish anything! While we were sitting on the grass, with Cat lined up at the exchange point, my mom came running up for her final exchange. We screamed for Cat as she ran off in the distance. 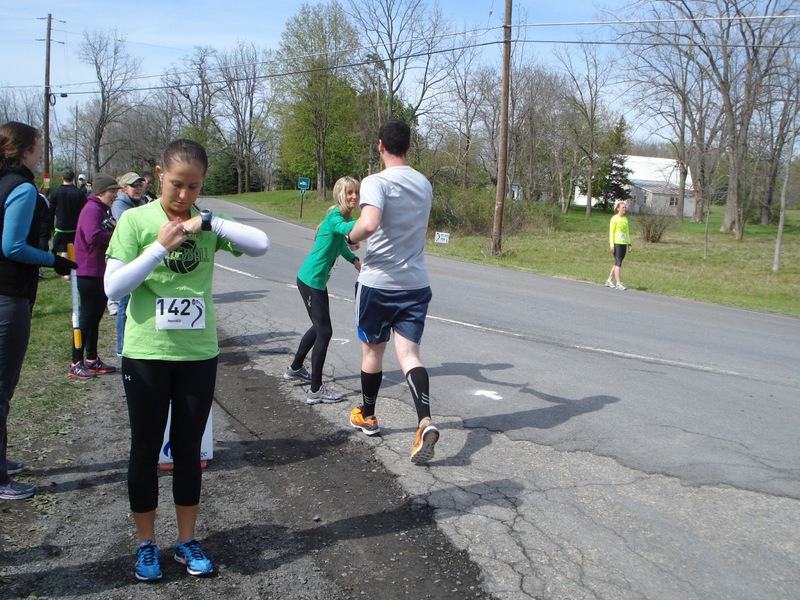 We were unable to follow her during any of this leg so we wouldn't know how it was going until she made it to the next exchange. Since we had some time, we hung around and used the porta-potties (I used the bathroom every possible moment from then on since I didn't want to have any more issues or possible disqualification). Our support crew had turned up and we were able to talk with them for a little while. We finally went to the next exchange point and again used the bathrooms! It was a long walk but Rena and I chatted the entire way there and back. As we were waiting for Cat it was getting closer and closer to the 9 minute pace time, but then she came in sight with 2 minutes to spare! Unfortunately, she hurt herself on the trail but she pulled through. She definitely had some hard legs, we all did, and she also ran the most with a total distance of 14.3 miles for the day. 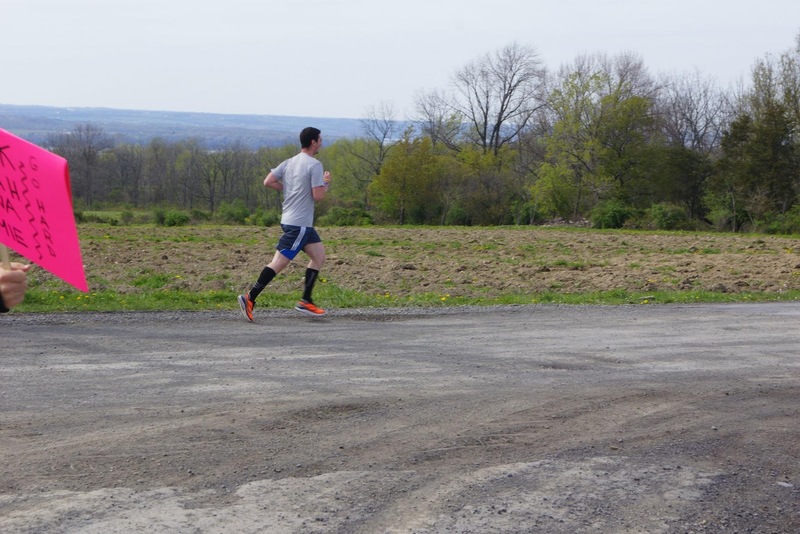 We continued on to all of the next exchange points, and the support crew was finally able to cheer for Mark on one of his legs! 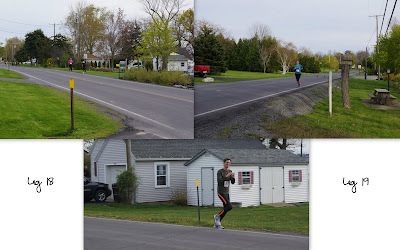 Mark and Sarah had a beautiful section to run along and we all marveled at the houses that probably cost millions of dollars. 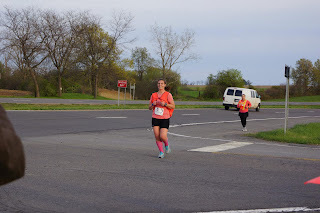 Before I knew it, Sarah was running in to exchange 19 which meant that in about 20 minutes I would be running the FINAL leg of the relay! Since the rules stated that anyone running past 7pm had to wear a safety vest, I put on the flimsy, cheap one that they gave us and got ready to run. It had cooled down but I still wore my t-shirt and shorts. Rena came flying down the hill shortly after we arrived to the final exchange point and she handed me the slap bracelet and I was on my way! 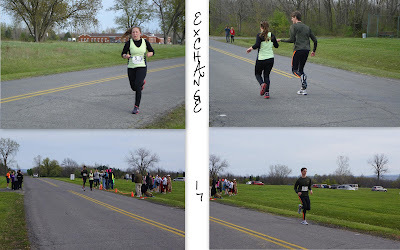 Of all of my legs, I knew that this was going to be my one chance to run sub-9 minute pace. I just concentrated on doing the best job for my team and I FINALLY passed a runner! Soon after I saw the support crew and they cheered me on. I didn't know it at the time but I wouldn't see them again until the finish. 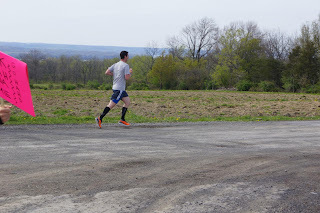 This leg had more downhill and flat portions than any of my other legs and I tried to take advantage of this by pushing my pace. I saw a Lowe's coming into view and then turned the corner toward Geneva. 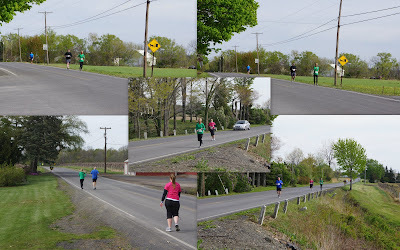 At one point I saw some runners ahead of me run off the main road into a park, good thing there were some cones set up to indicate that we had to do this! 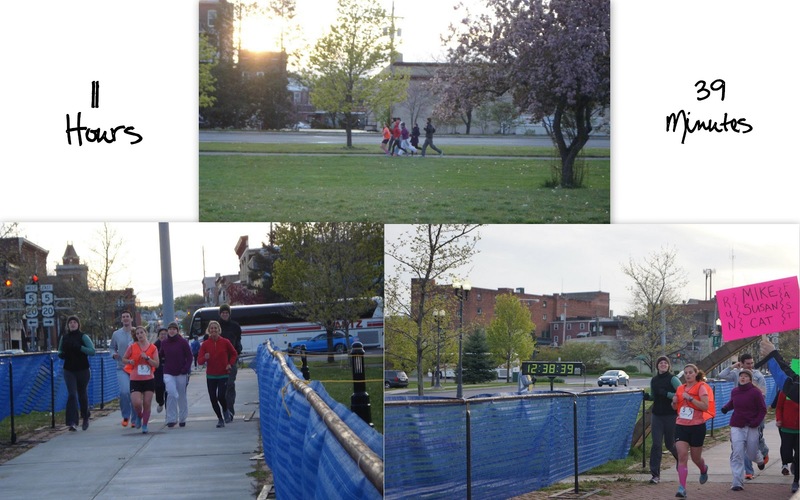 I followed their lead and ran across the grass into Lakefront Park. We ran this portion along the lakeside path and at one point I saw a huge group of people. We were supposed to cross the finish line as a team, but I knew it was too early for that so I thought it might be some spectators and picked up the pace since my dad, Tom and Stefan might have been there. It turned out to be a group of kids taking photos for their prom and they cheered me on as I ran by them. I passed one more runner and then I was only .5 miles from the finish line. I saw the "start" banner in the distance and my team waiting for me! 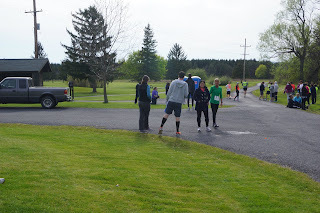 As I got to them we started running as a group and I could hear the announcer at the finish line. 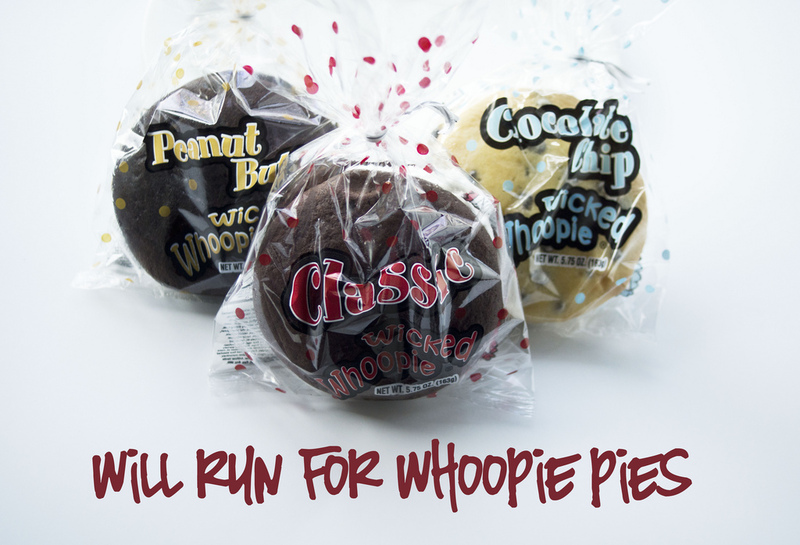 I picked up the pace and as we turned the final corner I could hear, "this team looks like they will run for a whoopie pie! 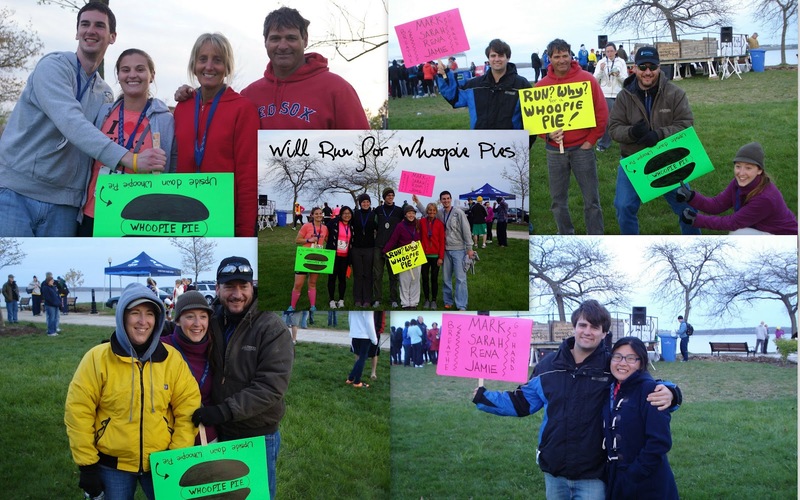 Let's hear it for team 'Will Run for Whoopie Pies'"! We crossed the finish line at 7:39pm, which meant that our total time was 11 hours and 39 minutes, an 8:59 pace! 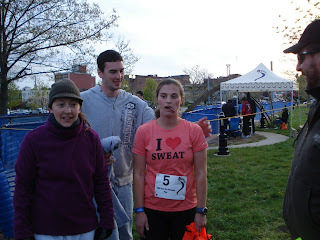 My dad later told me that in order for us to beat the 9 minute pace time, I had to run my leg at a sub-9 minute pace. (For my 3.71 mile leg I ran 8:21, 8:55, 9:11 and 8:59 pace for an average pace of 8:51). We ended up coming in 109th out of the 150 teams that finished. After getting our medals, we took some team and support crew photos and got some food! It was sad that the day was over but we had a great time! I'm not sure we could have asked for a better group of people, both runners and our support crew. There's already talk of doing it again next year! Are you sad that the relay recap is over? Don't worry, I'll have more relay fun in a "tips for surviving a relay" post tomorrow. Not that I'm an expert or anything! 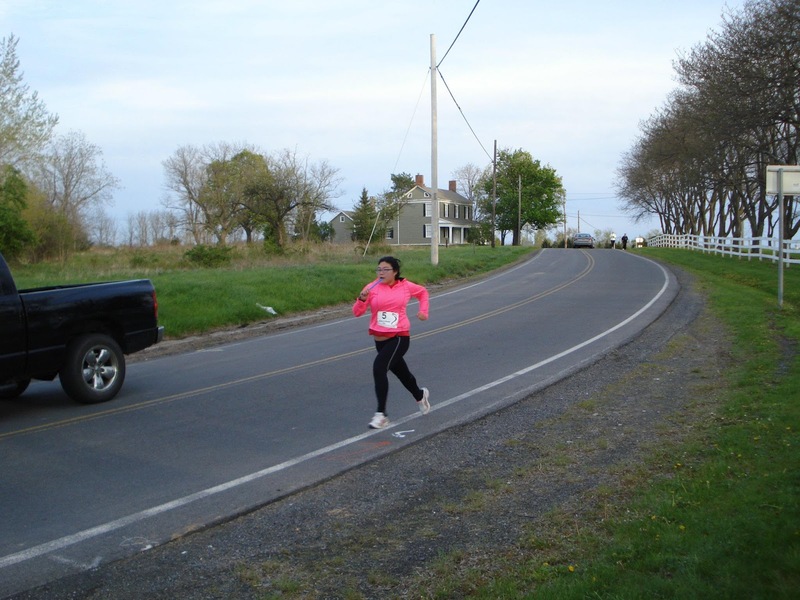 If you lived closer I would try to convince you to run in the Reach the Beach New Jersey relay with me! We need 2 more runners! WAY TO GO!!!!! super impressive. I'm going to train so hard for our relay next year ;) I love relays I want to do a ragnar! nice sub 9min pace at the END! holy speed batman! Thanks Ali!! We definitely have to do that relay again! You know you could always do Reach the Beach with us (it isn't Ragnar but it is the exact same concept). 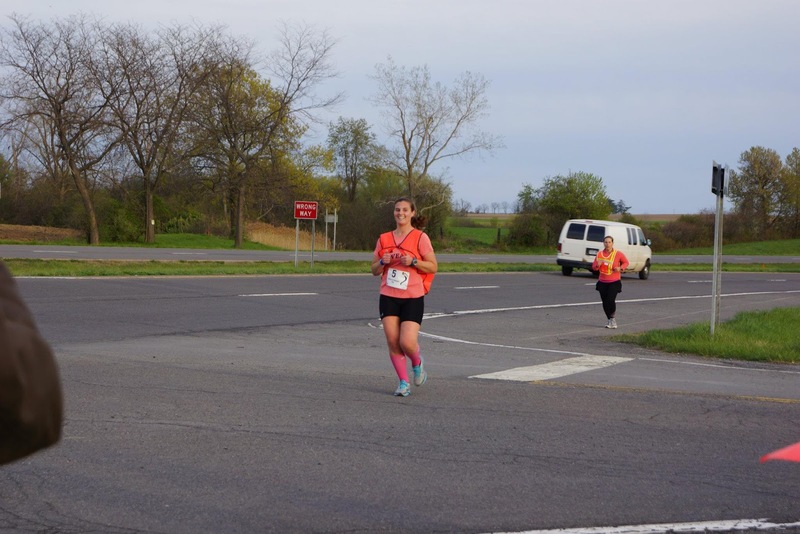 I really wanted to have at least one leg with sub 9 minute miles and I knew that was the one to do it! Wow- what an exhausting but amazing experience! Congrats to your whole team... you guys did awesome. This was a really fun series to read. And nice work on your final push! Thanks Laura! I enjoyed writing it! Fantastic last leg! Sounds like y'all did fantastic! I can't wait for your tips to a relay! Thanks Mandy! It was a great time! Great recap!! Can't wait for October!! Me too! It's going to be so much fun! Wow congrats to all of you! Looks like exhausting fun. Can't wait to hear your tips. I need all the help I can get! Thanks Jenny! 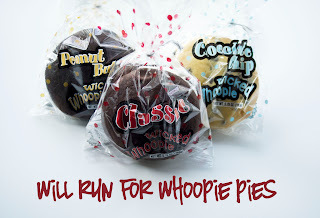 Haha my mom did bring 4 whoopie pies, we were the only ones who ate them though since two of our runners have gluten allergies. Haha that's funny it made you think of the Hunger Games! We all think Sarah looks like Katniss! What a great race:) I loved reading all your posts, sounds like so much fun! Awesome job team! Thank you!! I'm glad you enjoyed them! Dad and I have enjoyed reading this three part series..even though we were there!! Dad did an awesome job taking pictures...everyone looks so good!! 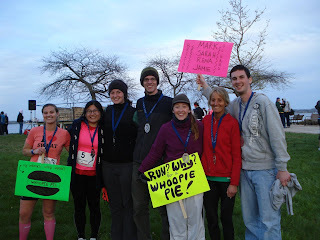 !It was an awesome race and a fantastic group of people!!! Thanks mom! I'm glad you had a great time and dad did do a great job with the photos! That is freaking fantastic you met your goal time! Way to go on your relay. I've been addicted to your posts. I love it! I'm getting so excited for my relay now! Thanks Jen!! You are going to do amazing at your relay and I can't wait to read all about it to be better prepared for our own RTB! Very nice job! You had an excellent final leg and I can't believe you guys came in averaging 8:59 per mile for the entire relay. That's really impressive! Thanks Suzanne!! We did great! WOW! What a super effort from your amazing team!! I loved reading the race re-cap. Thanks Kristin!! I think most people have recovered, I'm not sure how Cat is doing but I hope she is better too! Congrats on the relay!! I went to run club last night and apparently the group of women who ran this actually came in first. They are all the super fast girls, but it turns out they only beat the second place team about 2 mins. Guess it was a close race. Thanks Joanna! 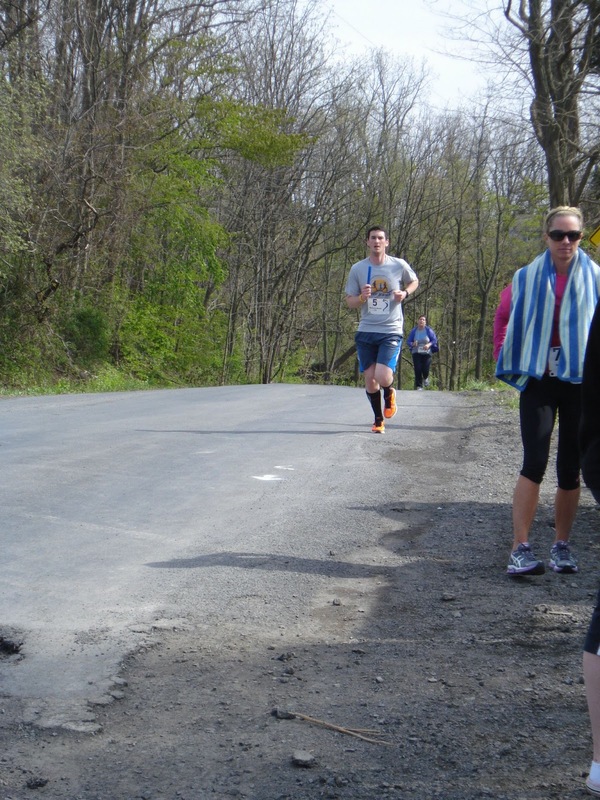 We saw your club runners and they passed us around the halfway point. They were doing amazing! Very cool, looks fun! I'm working on a relay team for September and am super excited about it! Thank you! You are going to have a great time at your relay! Which one are you doing? Oh my gosh - it sounds like such a fabulous journey - and pulling an average of 8:59 - WOO-HOO!!! Thank you!! It was a lot of fun, I can't wait for next year!